Politics • In unusual step, prosecutors confirm probe into allegations involving John Swallow and Jeremy Johnson. Rick Egan | The Salt Lake Tribune David B. Barlow visits with friends and relatives after his investiture ceremony as a new U.S. Attorney, in Judge Benson's courtroom in the Frank E. Moss U.S. Courthouse, Friday, December 9, 2011. Trent Nelson | The Salt Lake Tribune Utah Attorney General candidate John Swallow makes his victory speech on the night of the primary election, at the Little America Hotel in Salt Lake City, Utah, Tuesday, June 26, 2012. Swallow's wife, Suzanne Swallow is at right. Paul Fraughton | The Salt Lake Tribune Jeremy Johnson leaves the federal courthouse in Salt Lake City on Friday, January 11, 2013. Steve Griffin | The Salt Lake Tribune John Swallow, Chief Deputy Utah Attorney General, and newly elected Utah Attorney General, in the attorney general's offices at the Utah State Capitol Building in Salt Lake City, on Dec. 3, 2012. 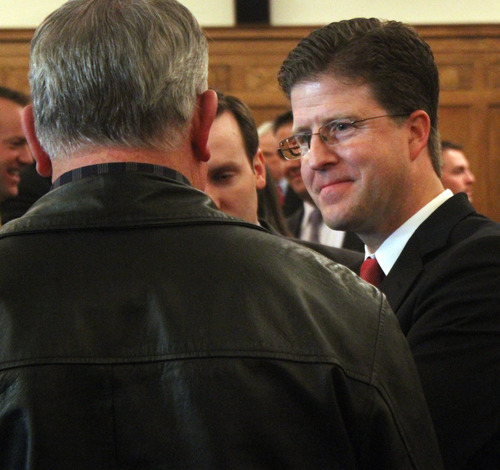 Swallow intends to follow Mark Shurtleff's policies toward polygamy. Sexual abuse and fraud will be prosecuted, but not bigamy itself. Associated Press file photo Senate Majority Leader Sen. Harry Reid, D-Nev., speaks during a news conference on debt ceiling legislation on Capitol Hill on July 30, 2011, in Washington. 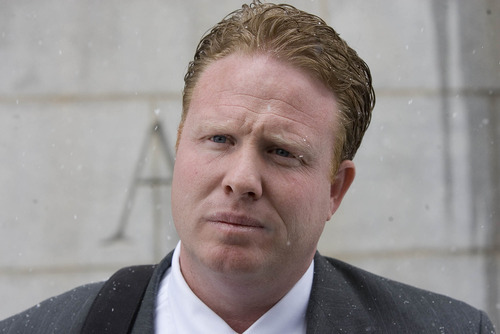 Salt Lake Tribune file photo St. George businessman Jeremy Johnson was arrested in Phoenix on Saturday by IRS agents on a charge of mail fraud. 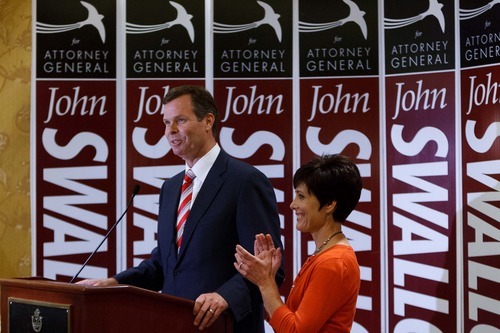 The U.S. Attorney&apos;s Office confirmed Friday that Utah Attorney General John Swallow is the subject of an ongoing investigation by the Department of Justice and the FBI. The acknowledgment marked an unusual step for the agency, which typically does not comment on ongoing investigations. The office said in a statement it was confirming the probe due to "extraordinary public interest in the matter." "We want to reassure the public that we, along with the FBI, have been investigating the allegations and will follow the facts and the law in doing so," the statement said. "We will not be commenting further." Swallow said in a statement Friday that he is happy the U.S. attorney is investigating "the baseless allegations against me." Former U.S. Attorney Brett Tolman said that the allegations surrounding Swallow present a unique situation for the state&apos;s top federal prosecutor. "I think when there are circumstances like this  where it&apos;s a sitting attorney general in the state and the whole state is wondering, &apos;Is anyone looking into this? Is anything being done?&apos;  It&apos;s an appropriate exception to the policy that you don&apos;t confirm or deny the existence of an investigation," Tolman said. 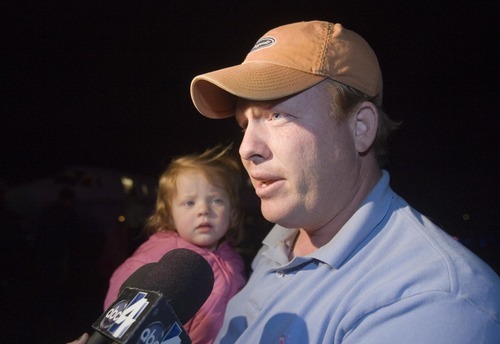 The statement does not say when the investigation began, and sources had told The Salt Lake Tribune last month that they had already been interviewed about indicted businessman Jeremy Johnson&apos;s relationship with Swallow, among other issues. Swallow, on Jan. 14, asked U.S. Attorney David Barlow to conduct an investigation into the allegations by Johnson that Swallow had helped broker a bribe to enlist Senate Majority Leader Harry Reid, D-Nev., to help derail a Federal Trade Commission investigation into Johnson&apos;s businesses. Swallow has denied any such scheme, saying he merely helped Johnson hire lobbyists to work on his case. 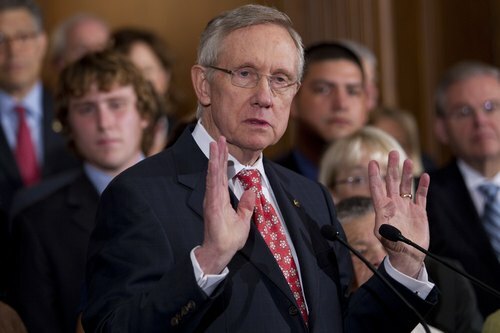 Reid&apos;s office has said the senator has no knowledge of the matter. Typically, investigations into elected officials are coordinated with the Public Integrity Section in Washington, D.C.
Utah Democrats praised the U.S. attorney for taking the matter seriously. "It has always been our position that the serious nature of these accusations against Attorney General Swallow demand a serious, impartial, non-Utah investigation to follow the facts, wherever they may lead," Utah Democratic Party Chairman Jim Dabakis said in a statement. Gov. Gary Herbert said Thursday that people should await the results of the federal investigation before judging Swallow. 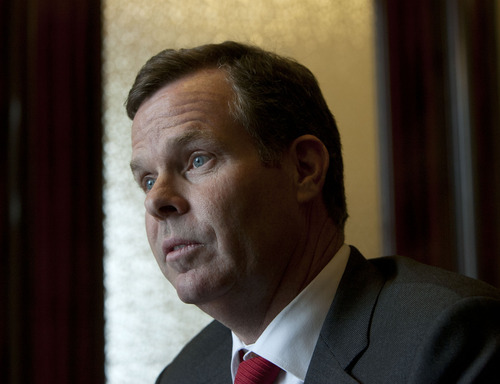 His comments came the day after Utah Republican Party Chairman Thomas Wright said that Swallow had made "mistakes" in judgment in his dealings with Johnson. Both Wright and Herbert called for changes to the state&apos;s ethics laws regarding elected officials, including an ethics commission  which does not exist now  to hear complaints against state officers and restrictions on outside consulting work by state employees.